Who finished the paper edit? This guy. Now I just need to enter all that into word. Hoo boy, this is going to take a while. It might take so long in fact, that I’ve decided to delay sending the manuscript to the editor. I don’t want to rush anything out the door, not when there are clear and present things that I know can be fixed first. 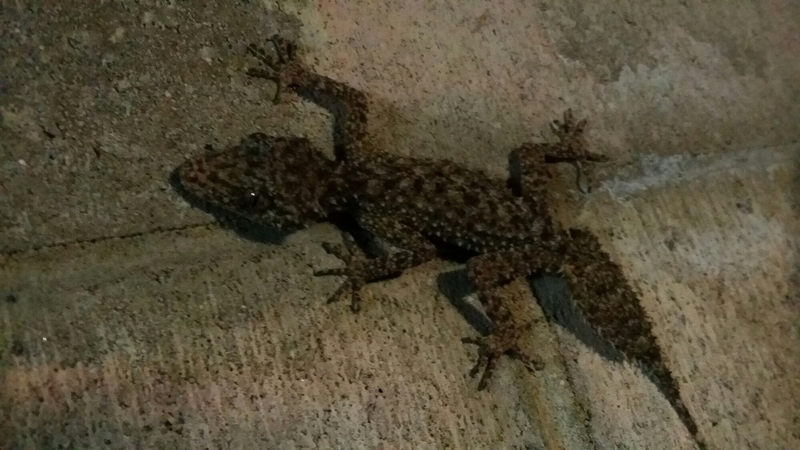 In other news there’s an impressive gecko living under my house in the garage. I will call him Prickles. May he and my dog never meet. I’ve also realised that my story structure could be farted around with a bit more: it was twelve chapters of around 12,000 words each, with each chapter exploring the story arc of one of the twelve characters in more detail. Now I’ve slapped an epigraph on each, renamed them Acts, and divided each act into chapters of around 2500 words. I figure this is good for getting me to infuse each chapter with its own small plot arc, with hooks, developments and conflict. How are you structuring your chapters, and how long are they? How much do your chapters effect the writing, or are they just arbitrary pausing points? Would love to hear how you roll on this! This entry was posted in Writing and tagged chapters, editing, Editor, epigraphs, gecko, Lizard, story structure, Writing. Bookmark the permalink. 2 Responses to Who finished the paper edit? This guy. I love using chapters to create a cliffhanger and make the reader go, “oh, man! I was looking forward to the next bit,” as you break the chapter just as it gets good. It is tool that requires a soft hand, but it’s definitely one that I know I love in any book that I’m reading.